Code Society is like Schoolhouse Rock for Computer Science. They use hip hop music and videos to teach computer science concepts to diverse communities. They are doing a $40k project on Kickstarter (and are about half way there) to create content and applications. I backed it earlier this week and you can back it here. 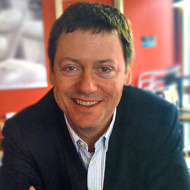 Fred Wilson is a New York City-based venture capitalist and blogger. Wilson is the co-founder of Union Square Ventures, a New York City-based venture capital firm with investments in Web 2.0 companies such as Twitter, Tumblr, Foursquare, Zynga, Kickstarter, and 10gen.